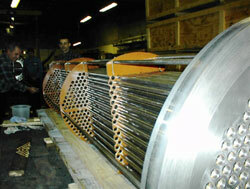 The tubes in heat exchangers are somewhat flexible since they are long and relatively thin-walled. Consequently they must have supports at intervals in the shell to prevent sagging and minimize vibration. Tube supports impart some directional effect to shell side flow but are primarily used to support the tubes in a bundle. Baffles are used to modify shell side flow conditions so that an optimum coefficient of heat transfer can be achieved. Without baffles, fluid would enter at one end of the shell, distribute itself across the tube bundle, and flow slowly, generally parallel to the tubes, to the outlet end. CMS Heat Transfer Division, Inc.
CMS Heat Transfer products include shell and tube heat exchangers, fixed tubesheet, and u-tube exchangers, oil coolers, pre-heaters, condensers, after-coolers, steam converters, kettles, reboilers and evaporators. CMS engineering include custom heat exchanger, process and mechanical design services to all TEMA and ASME conformance requirements. IMPORTANT DISCLAIMER: All information provided on this site is for reference. While we make effort to provide accurate information, CMS cannot be held responsible for errors either of omission or typographical.